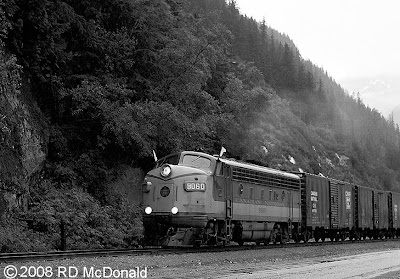 Northern Pacific Railway 5409A, Green River Washington, August 14, 1960. Just a few days after my 17th birthday, and I was anxious to get a shot of the Northern Pacific tip-toeing across the Green River Bridge. But low and behold, when I got there, "swamp gas," "fog!" I thought I was going to be “skunked” on my choice of locations to grab this eastbound freighter, because I did not have a back up plan! I loved shooting the Northern Pacific eastbound, climbing up out of Auburn - and the flats of the East Valley – they had nowhere to go but up – Run 8 territory! Plug "Covington" into the adjacent Google Search Engine. The Green River Bridge was just east of Auburn, and the roar was exhilarating as the hogger has his foot to the metal. As I heard her approaching, it was as though the breath of angles came through at the last moment, moving the swamp gas away just in the nick of time. And I got a memorable shot of an eastbound FT leading a gang of hoods onto the Green River Bridge. This is the “A” unit end of the A-B-C-D lash up. Here be her sister, NP 5409D. And you know what makes this extra special? I am the only one who shot this consist at this location! This is a one of a kind photograph, taken at this location! Railroad Stuff: Northern Pacific Railway 5409A, nee 6009A, built by General Motors at La Grange Illinois, as an FT, 1,350 horsepower, in 1945, serial number 2838. Traded by BN in 1971, for an SD45. 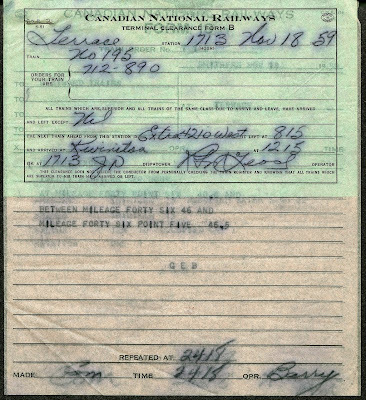 Canadian National Railways 9060, Mile Post 75, Skeena Subdivision, November 18, 1959. In a torrential downpour, we find Extra West 9060 scurrying west bound along the Skeena River, under cover of white flags, heading for Prince Rupert. White Flags and white bullet lamps indicate a train running off the published Employee Time Table. This is TRAIN ORDER country, real railroading that runs on flimsies, an employee time table, corrected pocket watch, moxie, and reasoning ability! In foreground is Trans-Canada Highway 16 - the Yellowhead Highway: 500 miles of gravel and dust in the summer; 500 miles of gravel and mud the rest of the year. 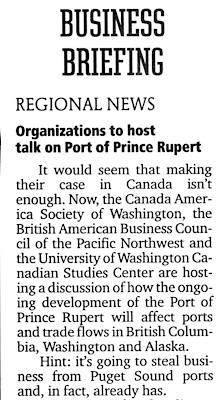 Prince George is 500 miles − 500 miles east of this location! Directly behind me is the mighty Skeena River, one of the major rivers of North America. Tracks, highway and river share close company for many, many miles! If one encountered a train at night, the drill was to stop and turn your eyes away from the locomotive. Even though crews would dim headlamp, turning away would protect your night vision. Log trains were especially scary, as bark, dirt and gravel would often fly off the logs. 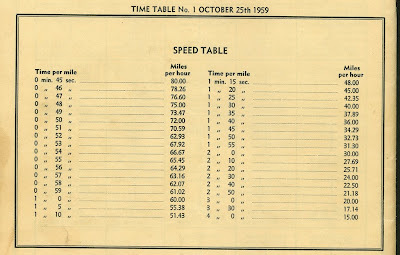 Geeze, those were exhilarating days up there, from 1957 through 1959! And this is one of my final photo shoots, as within a few weeks, we will be moving back to Seattle. 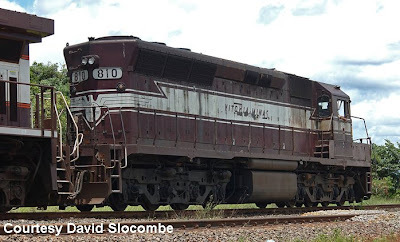 Railroad Stuff: Canadian National Railways 9060. Built by General Motors Division (GMD) London Ontario, as an F-7, 1,500 horse power, road class GFA-15c, December 1951, serial number A-330. Retired August 1971. 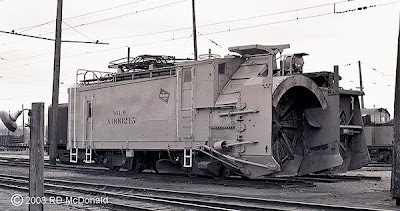 Rebuilt and renumbered 9156, September 1972, modified for snow plow service in southern Ontario by providing removable steel grill for the windshield and covers for the roof-mounted radiator fans, retired December 1989. 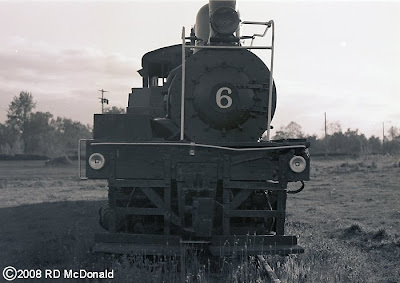 Crown Zellerbach #6, Cathlamet, Oregon, June 10, 1962. On a family vacation to the Long Beach Peninsula, we found the “Six Spot Shay” on display. 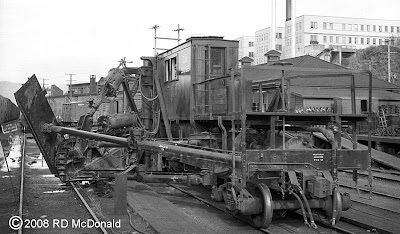 This locomotive is a Willamette Locomotive, built entirely from the ground up by Willamette Iron and Steel, who built a lot of logging apparatus. There is an interesting story behind the Corporate decision to compete with Lima, Ohio, beyond the scope of this article. I refer you to the book “The Willamette Locomotive” by Steve Hauff and Jim Gertz. "Shay" is a trademark owned by Lima Locomotive Works. Lima’s come back to the Portland upstart, was to incorporate all the changes loggers wanted in a locomotive, incorporating them into the "Pacific Coast Shay." 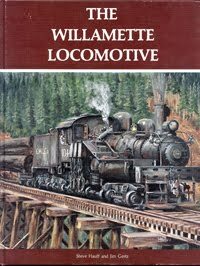 In all, 33 “Willamette’s” were built, with Car Number 13 built for Simpson Logging, delivered in October 1928 as road number 6. “This 70 ton Shay locomotive built by Willamette Iron and Steel Company at Portland Oregon, first saw service at Crown Willamette Paper Company’s Young’s River logging operation near Astoria, Oregon, in December, 1923. 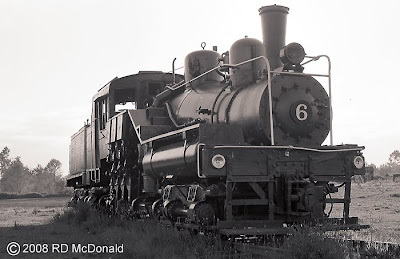 Named for Ephraim Shay, a Michigan logger who built the first of the geared locomotives around 1879, this locomotive was sent to do the job where other engines could not venture – up steep grades; around short radius curves; across trestles spanning deep ravines in the forests. Six Spot was transferred to Cathlamet shortly after going into service near Astoria, only to return to the Young’s River logging operations in 1928. Later, she was assigned to the Clatsop Railway Company, a common carrier line, operated by Crown Willamette to haul logs from its Lewis & Clark camp near Seaside, Oregon. Railroad Stuff: Crown Willamette Paper Company #6. Construction Number 13, built at Willamette Iron & Steel, Portland, Oregon, delivered January 20, 1924. Known as model 70-3, she was a 70 ton 3-truck "Shay" type, built at a cost of $22,500! Western Pacific 704, Oakland Yard, November 27, 1960. I am a tender 17 year old, and our family has travelled to Oakland to spend Thanksgiving with my Uncle. Dad and I drifted down to the Western Pacific to see what's what, and find this gem! Let me explain why she's a gem. Shortly after the Interstate Commerce Commission approved the UP-WP-MP merger on December 22, 1982, Western Pacific's locomotives were scattered to the winds, partially due to efforts by Union Pacific to erase all remaining signs of the once proud and unique Western Pacific as quickly as possible. GP7's 701, 703, 704 705, 706 and 710 were sold to Mountain Diesel Transportation in July, 1987. The large round object on the end of the 704's hood is a longtime Western Pacific trademark: a large, single bulb headlight made by the Pyle National company. 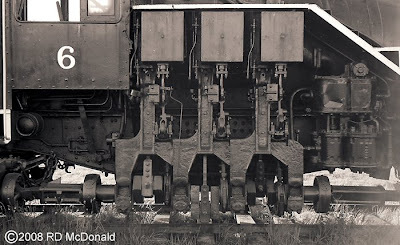 Nearly all non-streamlined WP locomotives were built with these lights until 1967. Originally delivered in the road's Zephyr-inspired Aluminum & Orange paint scheme, we see her here in the Perlman’s Green scheme. Gem? Yes! She’s been immortalized; Atlas made an N scale model of her! Railroad Stuff: Western Pacific 704, built by General Motors as GP-7, 1,500 horsepower, October 1952, serial number 17028. 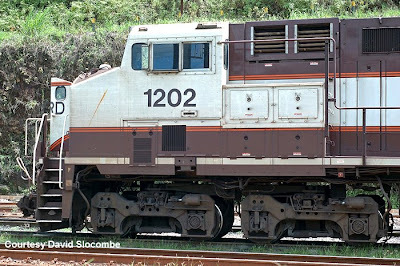 Became Union Pacific 102 (having difficulty verifying), and sold to Mountain Diesel Transportation in 1987. 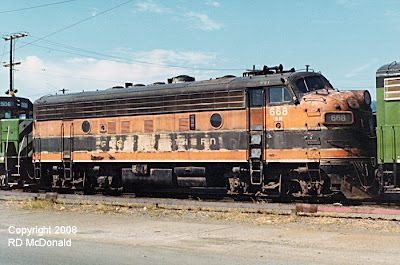 Northern Pacific 3617, Yakima Washington, July 21, 1967. So I am in my final year in the Air Force, stationed at Hamilton AFB. I became smitten by a righteous young lady, and we consummated our nuptials in the Base Chapel. 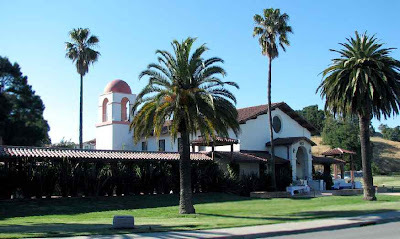 Ever notice how churches on military bases are “chapels,” not churches? Be that as it may, we charted out a West Coast honeymoon to see several National Parks, beginning with Mt. Shasta. By and by we ended up in Yakima, on our way to Mt. Rainier National Park. No sooner had we checked into our motel than I heard the unmistakable sound of heavy horsepower near by. Flipping open the bathroom window, low and behold the mainline of the Northern Pacific! This lash up was pulling on a westbound freighter and was creeping along meeting an eastbound train. These units were fresh off the assembly line at La Grange, so much so I swear I could smell the DuPont Imron! I didn’t stick around to watch the meet complete; remember, I am on my honeymoon, and there is a righteous young lady back in the motel room who does not want to be upstaged by a diesel locomotive! 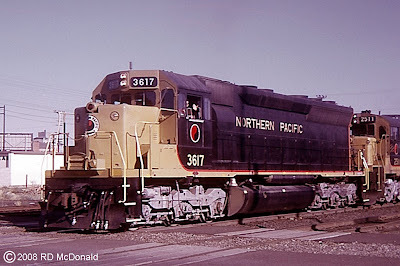 Railroad Stuff: Northern Pacific 3617, built by General Motors as SD45, 3,600 horsepower, 1967, serial number 33038. Became Burlington Northern 6417 in 1970, retired in 1987 and scrapped by Pielet Brothers. Photograph of her sister, BN 6416, nee Northern Pacific 3616, in the so-called “Cascade Green” scheme. Great Northern 358C, Elliott Avenue, Seattle, July 9, 1960. For the first time since leaving King Street Station, the hogger has a brief opportunity to clear the throats of his two unit consist. 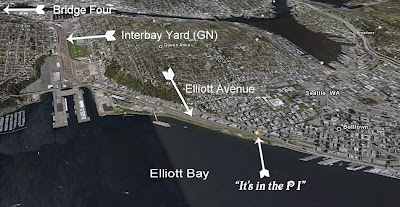 Running along Seattle’s waterfront, parallel to Elliott Avenue, the Great Northern’s International Service is running between two of the Pacific Northwest’s beautiful cities – Seattle and Vancouver. Within moments of passing me, the throttles are pulled back for the restricted speed run through Interbay Yard and out across the Ship Canal over “Bridge Four.” The urge for unleashing the V-16’s continues past Golden Gardens Park, where finally the train can run at speed at water level up the magnificent Puget Sound. On a good day, the Olympic Mountains are seen off in the distance. 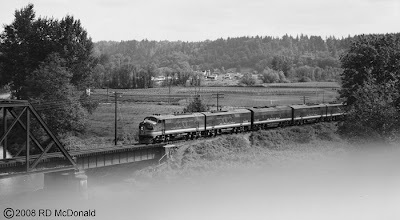 In it heyday, Great Northern ran two Internationals a day from between Seattle and Vancouver, from 1950 through 1969. And the fare? $11.25 First Class, $8.90 coach - round trip! 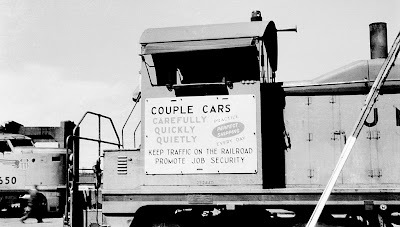 After “The Merger” there were hundreds of locomotives that would require repainting. Here is an example of the “interim” markings; “BN 668” painted on the cab. Looks like employees used a belt sander to try to obliterate the Great Northern logo. Oh, yeah. The reference to “It’s in the PI” on the Google Earth photo. Every bit a Seattle land mark as the Smith Tower or the Space Needle, the 30-foot glowing ball of the Seattle Post Intelligencer newspaper is an absolute beauty at night! 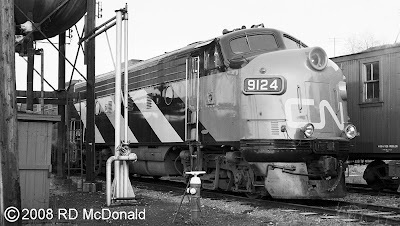 Railroad Stuff: Great Northern 358C, built as General Motors F3A, 1,500 hp, December 1947, serial number 4690. After “The Merger” became Burlington Northern 9708. 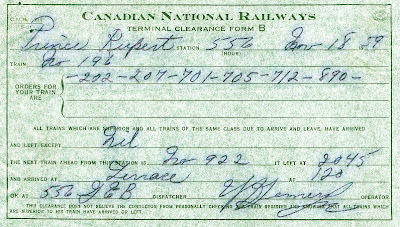 Scrapped at Precision National in December, 1972. 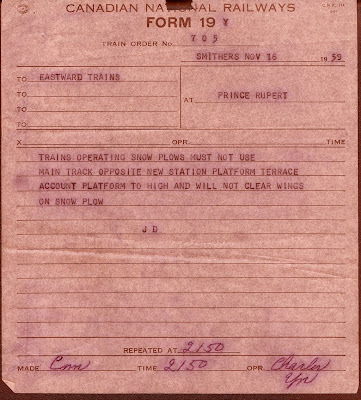 Prince Rupert November 18, 1959, Train Orders. In this modern day and age, locomotive operators operate over a subdivision responding to line side light signals. They respond to an immediate, simple stimulus of light signals, and must obey them precisely "stop - go- slow". 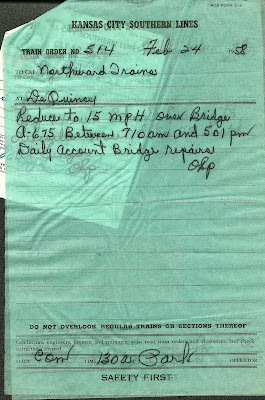 But “back in the good old days” operation over the subdivision by time table and train orders required completely different skills, including memory, analysis and judgment, reference to time, comprehension of written instructions, and calculations of time and distance measured out by the mile posts and speed tables. And, an intimate knowledge of their subdivision. It is, therefore, this type of operation that was infinitely more interesting and stimulating. Railroad men were proud of their skills, and rightly so. 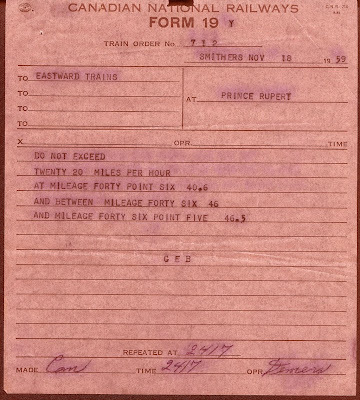 While there are variations on the theme, train orders were written on two types of forms, the so-called "31's," which had to be signed for by a member of the train crew, and "19's," which did not. 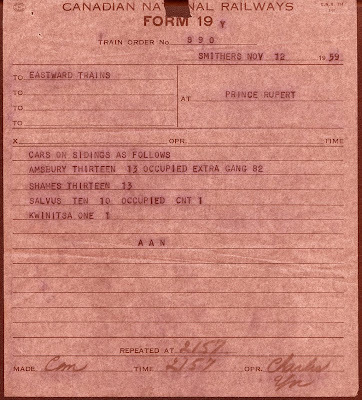 “31’s” were employed when the dispatcher needed written confirmation that the affected train actually had the order, while the “19’s” were used when he did not. 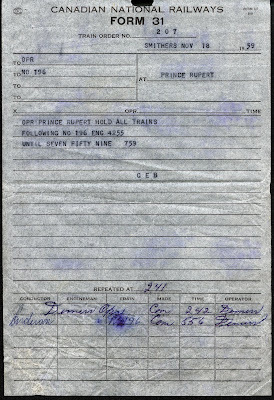 I spent many an hour at the Yard Office in Prince Rupert as a teenager, watching the telegrapher assemble a set of flimsies – so called because the paper was onion-skin thin, composed of blank train order form 19’s, sandwiched with carbon papers, and reeled into the Remington typewriter. 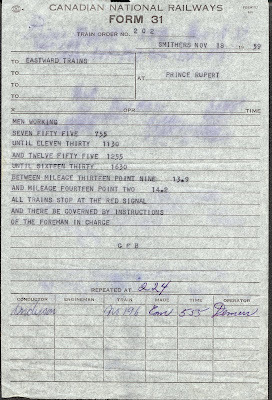 “Smack-smack-smack” as the typewriter spelled out instructions from the dispatcher at Smithers, droning out the words over the company telephone line, dictating meets, slow orders, and the minutiae of Northern BC railroading. The operator in turn, would spell out meeting points, and annunciate numbers back to the dispatcher, to insure accurate communication, to prevent disaster. 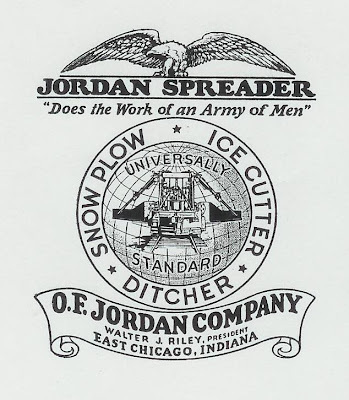 The dispatcher was referenced only by his initials, for each order in the set, with a communication time, repeated time, and operator’s last name. 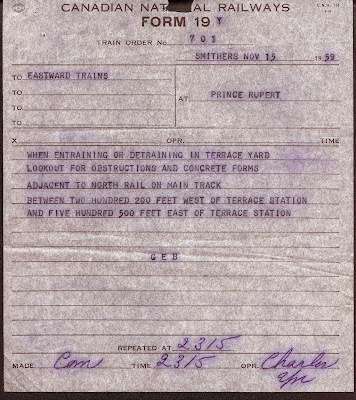 The Skeena Subdivision was a Train Order and Time Table operation. There were no radios in those days, only a few track side phones. The entire symphony was played out between Conductor and Engineer, synchronized by the ubiquitous pocket watch. I am truly blest to have been able to experience these operations. It was really exciting for me as a teenager to watch the Conductor, Engineer and crew trouping into the Yard Office, telling jokes, warming hands, small talk all around; a cup of rotten cup of burnt coffee. 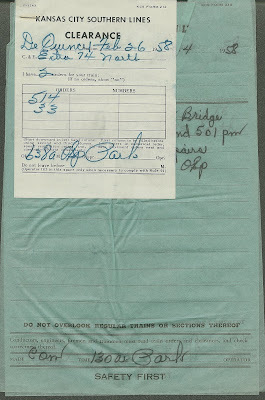 And then the operator hands the stapled – sometimes straight pinned - flimsies to the Conductor and Engineer, who will compare train order sets, check pocket watches against the master clock on the wall behind the operator, sign the Train Register, grab their grips and head out for the locomotives. 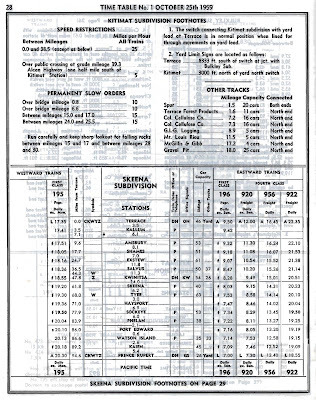 The return trip on 195 had only two orders, the one about speed restrictions – 712 – and 890 referring to cars on sidings. The work crews - 202 - and preceding train – 207 - were irrelevant on the return trip. 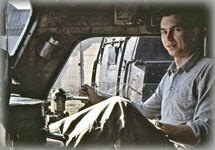 I was glad on the return trip on 195 that it was dark in the cab, because as we rumbled through the night, with the chanting of the V-16, the generator whine and smell of diesel oil, I was fighting back tears. I knew I was going to miss these guys and the Skeena Subdivision. 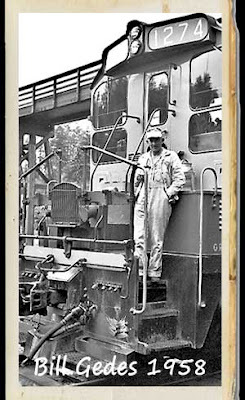 A fellow by the name of Bill Geddes was running the train, I recall the fireman’s name was “Floyd” and the Conductor was Stan Wozney. The plan was for me to ride to Kwinitsa in the caboose, and do an end for end with the brakeman, who would give me his seat in the locomotive for the run on up to Terrace. Of course these guys subjected me to the usual pranks afforded newbies, including the “Exploding Locomotive. This called for a wadded up piece of train order being stuffed into the exhaust port on the brake stand. 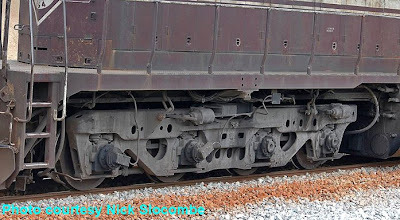 After setting me up with the notion that one of these locomotives could explode, the brake handle was hit, resulting in a loud “pop” which got the desired result! We whistled off with about two dozen cars, jogging out of Prince Rupert about 10 miles to the Columbia Cellulose Mill at Port Edward, where we picked up 60 or so empty log bunks, to be delivered to Kitsumkalum Log Reload just this side of Terrace. CNR 4215 is stripped down for branch line rail operations, with a small fuel tank and Flexicoil trucks. 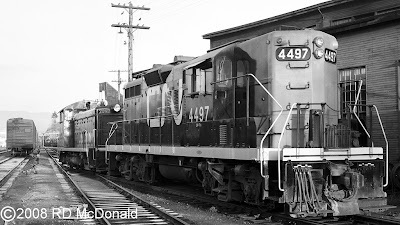 Railroad Stuff: Canadian National Railways 4215, nee 4597, GMD GP-9, 1,750 horsepower, built London, Ontario June 1957, sn A-1249. Renumbered 4380 in 1984, and rebuilt as GP9RM 7021 in 1991. 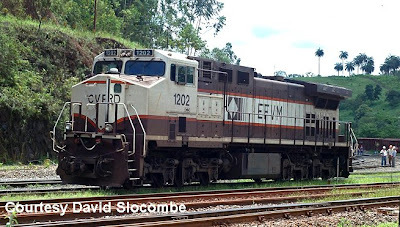 Wrecked at Coteau du Lac, QC on 6 May 1997 along with GP40 9429, retired 27 August 1997. My thanks to Union Pacific’s Ms. Zoe Richmond, Director, Corporate Relations and Media, Western Region, who sent me today’s blog photos! 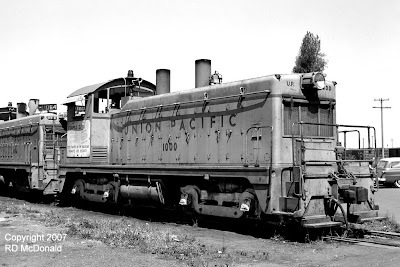 The Southern Pacific’s – now Union Pacific's – Natron Cutoff was a very special place for me. My wife and I spent many, many hours up there on the Willamette Pass, enjoying mountain railroading at it’s best. 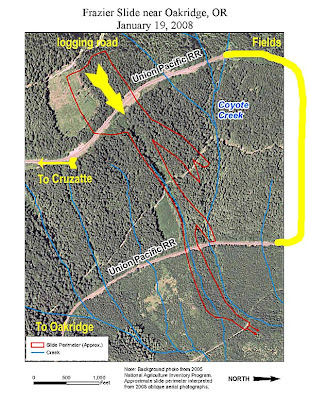 We’d pack a lunch, and head out up to Fields, Cruzatte, and Beamer Ranch Road, to photo Espee’s long double horseshoe curvatures up and over the Willamette Pass to Klamath Falls, thence to Grass Lake, Black Butte, down the Cantera Loop to Red Bluff and eventually, the Bay Area. See also Natron Cutoff #1, Natron Cutoff #2. So. Photo number 1. End of the line! 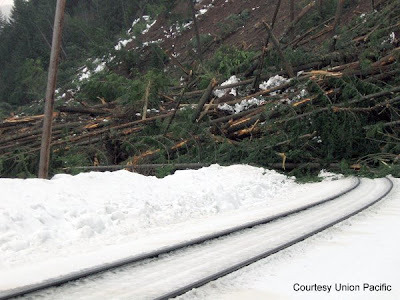 Rails disappear into a freaking mess of logs, stumps, snow, and earth. Where does one start? Photo number 2. Ariel view of the upper end, beginning, of the slide, just beneath a logging road. 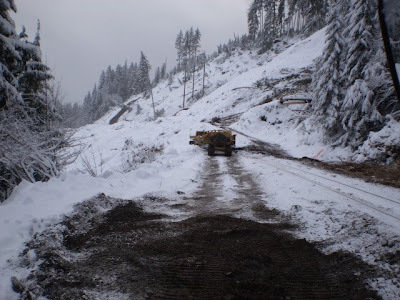 The slide begins just beneath a logging road, which gives rise as to who is responsible the slide. The slide heads down toward the lower end of the Field’s horseshoe curve, cutting the line for a second time! And in the red circle? Vehicles! Now you can grasp the immensity of the slide! Photo number 3. Union Pacific becomes a logging railroad! 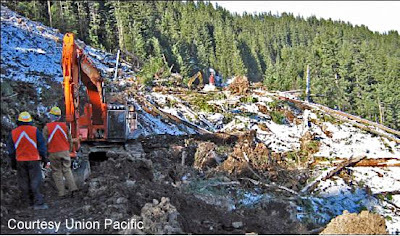 More than 200 carloads of timber are hauled down the mountain. Look carefully at the back of the train, and you will see a tong loader loading logs into rail cars. And finally Photo number 4. Taken from the southernmost point of the slide, looking north. 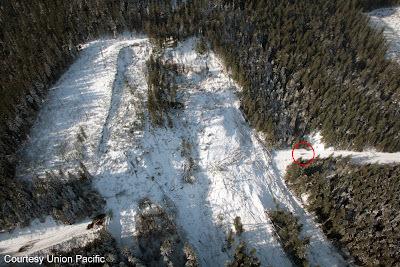 You can barely make out the log loader from Photo number 3, at the other end of the 3,000-foot wipe out. Ms. Richmond also confirmed that the former Siskiyou line - now Central Oregon Railroad - isn't up to par, which is why they are detouring thru Bend and Salt Lake City. Railroad Stuff: Union Pacific 576 built by General Motors La Grange as GP38-2, 2,000hp, May 1980, serial number 786272-14. Index: Coyote Mt Slide, Frazier Slide, Gp38-2, Oakridge, SP 576. Union Pacific 1454, Argo Yard Seattle, April 1960. Four rectangular and two porthole openings along with chain link fencing, are the hallmarks of the early “Phase II” F3’s. 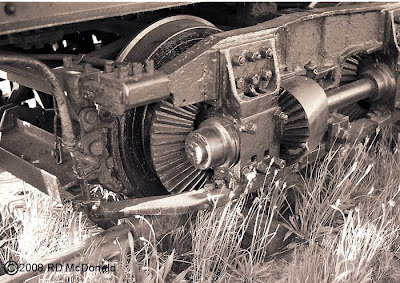 Although General Motors never referred to “phases” in their catalogs, locomotive enthusiasts created the “phases” to mark the progression of models. 1454 sports the annoying single blat air horn, mark of a true basic model without white-walls or power steering! UP 1451-1455 were built as UP 964A-968A for passenger service; renumbered to UP 900-904 in March and April 1948. UP 900-902, 904 were re-geared for freight service and renumbered to UP 1451-1452, 1454 in May to November 1953. I found this unit awaiting assignment at Argo Yard in Seattle. At the time, I didn’t realized how lucky I was to be seeing different railroads in Seattle. We just took it for granted. In 1960 I was one year away from graduation! 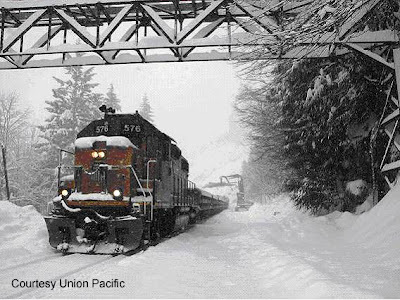 Although Union Pacific never laid rails from Portland to Seattle, they signed on the dotted line for track rights over the Northern Pacific, and once in Seattle, they could interchange with the Great Northern for access to Canada. Note the grab handle under the windshield, but how does one get to it? Well, it turns out they had a ladder with hooks on it, to get to the windshield! 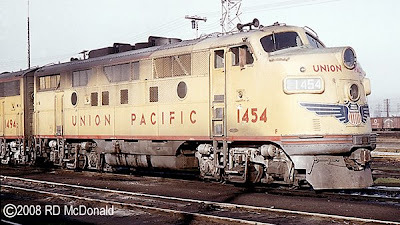 Railroad Stuff: Union Pacific 1454, General Motors F3A, 1,500 hp. Built as UP 967A, September 1947 at LaGrange, serial number 1454. Renumbered 903, renumbered 1454 January 1955. Retired and traded to General Motors in May 1963.